Authors: Lauk-Dubitsky S.E., Astrelina Т.А., Brumberg V.A., Nikitina V.A., Suchkova Yu.B., Usupzhanova D.Yu., Brunchukov V.A., Rastorgueva A.A., Lomonosova Е.Е., Kobzeva I.V., Makhova A.E., Karaseva T.V., Bushmanov A.Yu., Samoilov A.S.
Purpose: to create a protocol for complex cryoconservation of blood vessels in polydimethylsiloxane to create tissue-specific matrices. Material and Methods. The material ofthe study was the iliac arteries from postmortem donors, seized in the multi-organ donation, rejected for unclaimed and disposed of later. Polydimethylsiloxane was used as a coolant (PDMS) with a viscosity of 5-25 centistokes (Spectroplast, Russia). Bench testing of cooling and heating ofthe blood vessel in PDMS, testing of heating and cooling of PDMS up to operating temperatures (-80°C) in different ways and variants of its thermal insulation, assessment of different cooling rates ofthe vessel during cryoconservation, modeling of 3 types of working chambers for cryoconservation, sterilization and defrosting of up to 10 vessels, modeling of cryoconservation and thawing of vessels in PDMS under different conditions, selection of substrates from silicone and plastic for uniform fixation of vessels which are of size or size in the working chambers or without them. Results. The developed protocol allows cryopreserved from 1 to 10 or more vessels of all basic sizes both immediately after removal and after transportation to the laboratory, to vary the cooling rate from 1.5 to 300°C/min and above, to be used with different levels of laboratory equipment, as with liquid nitrogen, dry ice, and only with a medical freezer. Conclusion. The developed protocol allows to apply it in cases of complex cryoconservation of blood vessels to create tissue-specific matrices and can be recommended for preclinical testing. All articles of the authors: Usupzhanova D.Yu. , Suchkova Y.B. , Samoilov A.S. , Rastorgueva A.A. , Nikitina V.A. , Makhova A.E. , Lomonosova E.E. , Lauk-Dubitsky S.E. , Kobzeva I.V. , Karaseva T.V. , Bushmanov A.Yu., Brunchukov V.A., Brumberg V.A. , Astrelina T.A. Authors: Lunyov A.S., Clement'eva О.Е., Lunyova К.А., Zhukova M.V., Malysheva А.О. The aim of the study is to compare qualitative and quantitative characteristics of the experimental mice bone pathology using of Na18F and prospective radiotracer"Oxabigal, 68Ga" (complex of gallium-68 with oxa-bys-ethylenenitrile tetra (methylene phosphonic acid). Material and Methods. 30 nonlinear mice-female with the model of bone pathology were used in the experiment. Na18F and "Oxabigal, 68Ga" were injected to animals (i.v). Then mice were scanned using PET-imaging with subsequent calculation of pharmacokinetics parameters. Results. The intravenous injection of two radiotracers enabled to visualize of simulated bone pathology using PET. Conclusion. The experimental pathological foci were able to visualize within the first hour after i.v using of the "Oxabigal, 68Ga" and Na18F. There is a statistically significant difference between blood accumulation of radiopharmaceuticals labeled different radionuclides. However the difference doesn't matter for positive results we have got. 68Ga-labeled bone-seeking radiopharmaceuticals and its generator producing method are important supplement for independent choice of using different radiotracers for PET-imaging (such as Na18F) of bone pathology. All articles of the authors: Zhukova M.V. , Malysheva A.O. , Lunyova K.A. , Lun'yov A.S. , Klement'yeva О.E. Authors: Karimova D.Yu., Karimov B.N. Through the prism of contemporary processes of globalization, the comparative analysis of the legal foundation for employment of foreign experts in Russian medical institutions was done. Legal collisions that require resolution had been identified, and the competent authorities and legislators payed attention to them. All articles of the authors: Karimov B.N. , Karimova D.Y. Authors: Panina O.S., Privalova I.V., Chernenkov Yu.V., Pozgaleva N.V., Cherednikova E.N. One of the important social risk factors for the birth of a child with pathology in our time is tobacco smoking, with both mother and father. Goal: assess the formation of motivation for motherhood by questioning women with tobacco. Material and Methods. To carry out the research, we used the "Methods of Investigating Motives for Preserving Pregnancy" according to L. N. Rabovalyuk, N.A. Kravtsovoy; methodology "Motives for the conception of a child" by OA. Urusova. Results. When analyzing the results using the method "Motives for conceiving a child" (OA Urusova), in 45.7% of the women studied, an inadequate type of motivation for motherhood was revealed. An unconstructive motive is the high desire of the subject to have a being that will embody her unrealized dreams and plans. 54.3% of mothers, as the predominant type, have an adequate type of motivation for maternity. In addition, the motives for responsibility for the life of the child, the joy of motherhood, the awareness of the child's own values, the desire to have it for the sake of positive life goals and himself are revealed. Conclusion. Timely detection of inadequate motivation for motherhood and proper prioritization will reduce the percentage of pathological pregnancy, increase the birth rate of healthy newborns. All articles of the authors: Privalova I.V. , Pozgaleva N.V. , Panina O.S., Chernenkov Yu.V. , Cherednikova E.N. Authors: Krom I.L., Yerugina M.V., Kovalev Ye.P., Yeremina M.G., Vlasova M.V., Dolgova E.M., Bochkareva G.N. The process of institutionalization of healthcare, which is considered as one of the basic social institutions, is realized in qualitative changes in its structure. 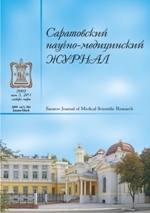 The authors note that changes in the social structure, the social differentiation increasing, crisis and dysfunctional processes in the healthcare institution in modern Russia have led to a change in status, social mobility descending and marginalization of the social and professional groups of the healthcare institute. In the authors' opinion the process of marginalization of the social and professional groups of the healthcare institute is explained by the «concept of status inconsistency» proposed by G. Lensky.